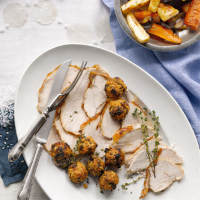 This recipe uses a turkey crown so there are no legs on the roast, just succulent breast meat. Preheat the oven to 170C, gas mark 3. Dry the turkey with kitchen paper and leave it out of the fridge for 30 minutes to come to room temperature. Beat together the butter and paprika. Sit the turkey in a large roasting tin and rub all over with the spiced butter. Season and roast for 35 minutes per kg plus 15 minutes. If the skin begins to colour too much, cover with a sheet of foil. Fifteen minutes before the end of cooking, scatter the turkey with the thyme sprigs. Meanwhile, make the stuffing balls. Heat the oil in a large frying pan over a low heat and cook the onion, chorizo and sultanas for 10–12 minutes, until the onion has softened and the chorizo is golden. Remove from the heat, stir in the remaining ingredients and shape the mixture into balls; place on a baking sheet. To check that the turkey is cooked piece the thickest part of the breast with a skewer and check that the juices run clear and there is no more pink meat. If more cooking is needed, return it to the oven for another 15 minutes and check again. Tip the turkey cooking juices into a small pan and set aside. Cover the turkey with a piece of foil and let it rest. Stir all the ingredients for the gravy into the pan with the turkey cooking juices and simmer gently for 5 minutes. Season to taste. Carve the turkey and serve with the gravy.